For our website relaunch, people affiliated to lyrikline like poets, local lyrikline partners and artists sent their personal videos. All the messages we received are uploaded here on our blog. Many thanks to all who sent us their greetings. Thanks also to everyone who gave us their feedback and congratulations on the new site and spread the word about it! Here’s a video from our Québec partner, the UNEQ, that introduces all the lyrikline poets from Québec in a very special way. 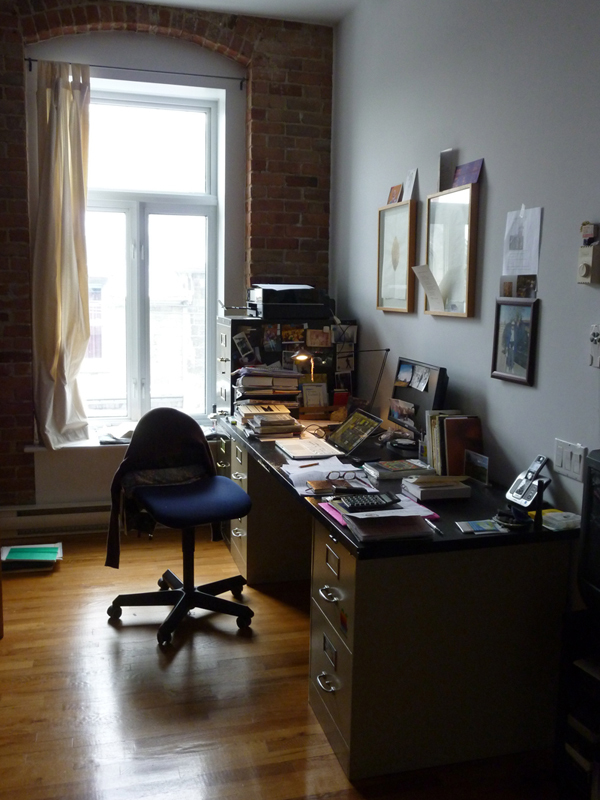 I travel a lot and write poetry anywhere I can set my laptop or my notebook, but my favourite place of poetry is at home in Montreal. My desk is simple, just an old door and two filing cabinets. It’s cluttered with thoughts and papers, but that never bothers me as there’s so much light beaming in the window, and the ceilings are high. My dictionaries and books and papers are here. It’s much quieter than elsewhere. Sometimes when I return from a trip, I don’t tell anyone I’m back, and I can write for a few days, living fully in words and the echoes of words, as if home were the most remote place on earth, as well as the most central.